The Franciscan rule of life. Although he was a layman, Francis began to preach to the townspeople. Disciples were attracted to him, and he composed a simple rule of life for them. In 1209, when the group of friars (as the mendicant disciples were called) numbered 12, they went to Rome to seek the approval of Pope Innocent III, who, although hesitant at first, gave his oral approbation to their rule of life. This event, which according to tradition occurred on April 16, marked the official founding of the Franciscan order. The friars, who were actually street preachers with no possessions of any kind and with only the Porziuncola as a center, preached and worked first in Umbria and then, as their numbers grew, in the rest of Italy. 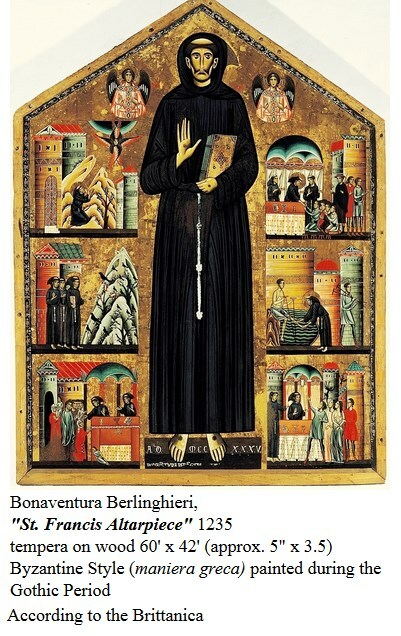 Context and Critical points of view: The previous section is a a biography of St. Francis's life however, Francis represents a pivotal figure that represents the transition in thinking between the Gothic period and the Renaissance. Previous to the life of St. Francis, the Catholic Church was the sole source of information about God for the layman (every day non-clergy). The Church interpreted, interceded and imposed a very clear point of view about God's teachings and was the sole source of biblical interpretation. In fact, laymen were not even allowed to own a Bible, not that they could afford one since they were hand written and very expensive. This point of view and religious/political system meant that everyday people could not actually "know" God for themselves and supported and maintained a point of view that one was born to a place on this earth that was unchangeable.